In this month’s issue of Connections, we invite you to explore the spaces at Jesuit colleges and universities where students, faculty, staff and administrators find opportunities for prayer or reflection. In addition to Catholic churches and chapels, these spaces include peace gardens, meditation rooms and retreat centers. At Jesuit institutions, our campuses are home to people of all faith traditions, as well as those who are not religious. The recent passage of the Consolidated Appropriations Act of FY18 (Omnibus bill) was a welcome relief for the higher education community. The Omnibus bill passed just before the third Continuing Resolution (CR) was set to expire on March 23, thus avoiding a government shutdown. President Trump expressed his opposition to the bill, due to its lack of border wall funding; nevertheless, he signed it into passage. In 1947, Rev. Raymond Schouten, S.J. became the 19th president of Canisius College. At that time, Canisius (located in Buffalo, NY) consisted of just three buildings. With Loyola Hall, the on-campus residence hall of the Jesuit priests, completed shortly before Christmas of 1949, Father Schouten (a 1927 graduate of the College) turned his attention to the spiritual needs of the Canisius community. 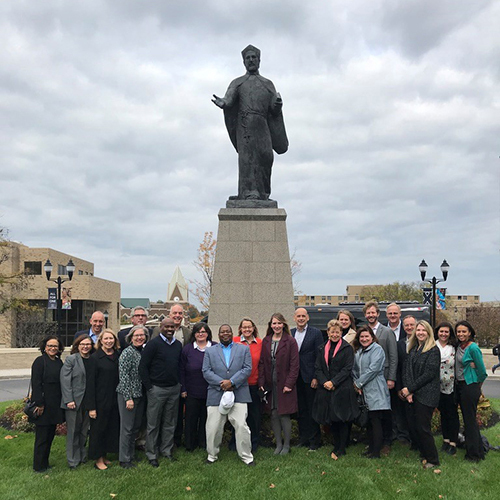 A few times each semester, I collaborate with my colleagues in Human Resources at the University of San Francisco (USF) to take a small group of faculty and staff on a tour through our campuses. As we walk familiar paths, past the buildings in which we work and teach every day, we talk about where we can find the sacred on our main campus, in the heart of San Francisco. This academic year, students in my Exploring Living Religions class at Santa Clara University have been invited to be “field researchers” of the local religious landscape, both on campus and off. The class was informed by research showing that young adults today engage in learning by focusing on experience. What does something feel like? How does it relate to my own personal relationships? Ornate wooden doors leading from a city street open to reveal natural light filtering in through the brilliant colors of stained glass windows in every direction. Passing the traditional baptismal font gives way to rows of pews punctuated with marble columns, leading to an ornate, exposed transept. Visitors walk around and behind the elevated altar, where they gaze intimately at enthroned statues of Christ and the saints. This is St. Francis Xavier College Church. There are plenty of beautiful, serene places to pray on campus at the College of the Holy Cross. But the newest space is just a few miles away from campus, at the top of a hill in West Boylston, MA with a view of nearby Wachusett Reservoir and quintessential New England foliage as far as the eye can see.